This transition mimics the appearance of changing from one slide to the next while stylizing your footage to give it a classic look. Direction determines which way the footage moves offscreen: Upwards or Downwards. Animation contains a list of speed presets that determine how the transition is executed. For more information on what these presets mean, visit the Animation Tweening page. Dolly controls how much the footage is zoomed in or out from. Max Blur dictates how fuzzy the footage is allowed to get during the transition. Frame Style contains a list of presets that controls the frame's appearance: Color Slide, Echokrome, Grungey, Dark, or Red Frame. 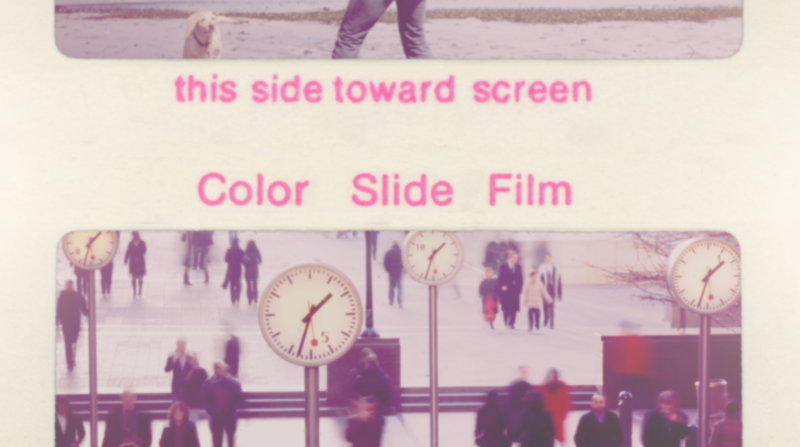 Enable Color toggles whether the control distortions (outlined below) are applied to the footage. Color twirls down optional color adjustments applied to the shot. Vignette Amount customizes how harsh the soft dark border is applied to the shot. Color Process increases or decreases the stylized color adjustments created using the controls below to mimic the look of classic film. Red, Green, Blue controls the vibrance of the individual color channels. Fading adjusts how muted the colors appear. Contrast increases or decreases the range between brights and shadows within the footage. Enable Light Leaks toggles whether an artificial light source shines on the footage and slide during the transition. Light Leaks twirls down customizations for the look of the artificial light source toggled above. Opacity controls how blended or apparent the light source is onto the transition. Flicker Strength adjusts the brightness of the light leaks during their flickering. Flicker Speed customizes the amount of time between flickers.